Heather Squires, who runs Sweetwood Farm near Mahone Bay, is outfitting her herd in tiny, knitted sweaters. It's more than just a fashion statement. It's about survival, she says. 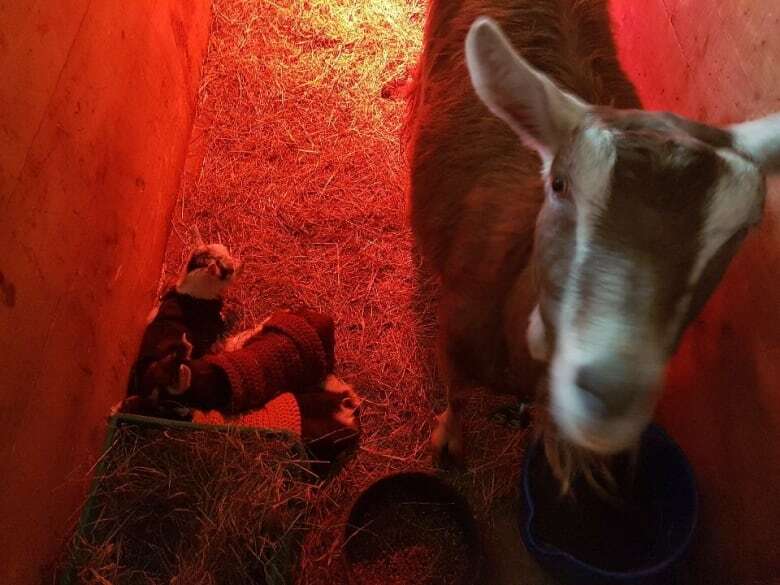 Nova Scotia winters can be cruel, especially for newborn animals that arrive before the warmth of spring. 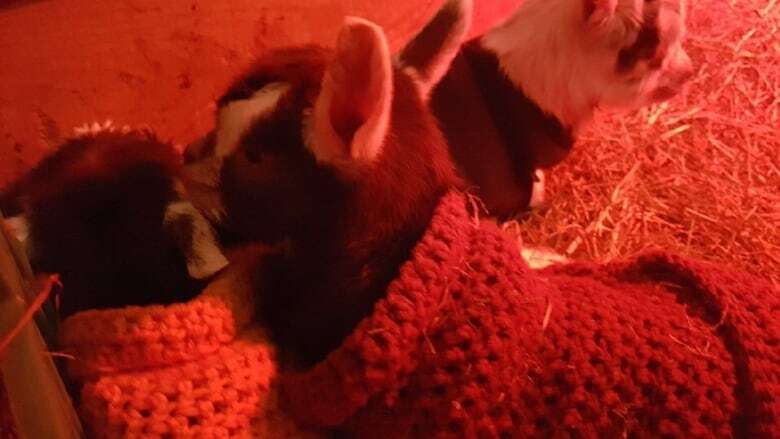 That's why a farmer near Mahone Bay, N.S., is helping her baby goats endure the chilly temperatures by outfitting them in tiny, knitted coats. Heather Squires, who runs Sweetwood Farm, is asking people to donate knitted and crocheted goat coats for the roughly 20-40 newborns she's expecting in the coming weeks. Don't know how to make a sweater fit for a kid? Just check out the many goat-specific patterns available online, said Squires. "They basically cover their torso and ... there's little openings for their front legs but generally not in the back legs so that they have space to pee and not actually pee on their sweaters or their coats," she said with a chuckle. The dairy farm usually welcomes a new cohort of goats in April or May, but last fall some male goats made a break for it. They jumped the fence and now about 15 females are nearing their due dates. Mother goat Pangaea was the first to welcome triplets earlier this week. As adults, Toggenburg dairy goats are well suited to the Nova Scotia winters thanks to their long flowing hair, but it can be very chilly for newborns, said Squires. "Baby goats when they're first born, of course, they don't really have any sort of fat reserves, so they have a very short period of time to absorb their mother's colostrum," she said. Squires said the babies's dad was born on another farm, and lost the tips of his ears due to frostbite. "Aside from losing the tips of your ears, they absolutely could not survive in fact for loss of body temperature," she said. Thankfully, she had three sweaters on hand to keep the triplets toasty. Squires isn't the only one who relies on cozy creations to keep her animals warm. 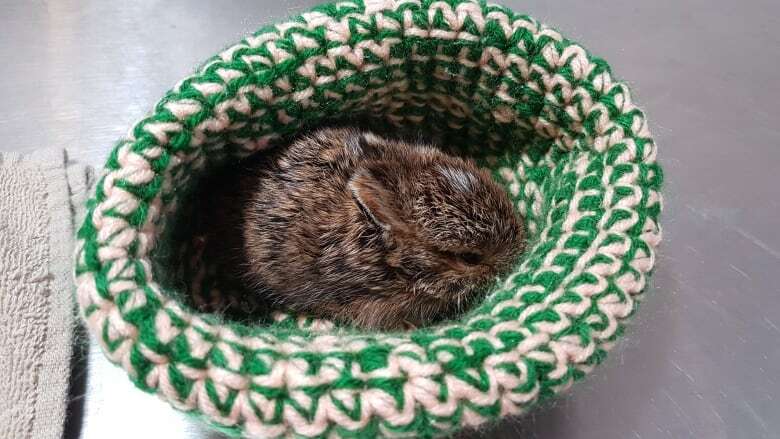 Murdo Messer, co-founder of the Cobequid Wildlife Rehabilitation Centre, uses hand-knitted nests for the baby birds, squirrels, chipmunks and groundhogs that arrive each spring. "Most of them don't have their eyes open yet, so it's just probably something that feels sheltered, protected and warm," he said, adding that they usually put a heated disk under the nests for optimal coziness. Messer said there's a dedicated group of knitters who keep the centre well stocked. It's a good thing, too. The centre is usually overrun with baby animals every spring. "It's quite hectic because they're little things that need to be fed, and they're being fed from dawn to dusk so it can keep us quite busy if we get a lot in," he said. Squires said the mother goat doesn't seem put off by her kids's new style. "The scent is probably the most important thing for a mother goat with respect to its babies so the fact that there's a sweater on the baby is a bit irrelevant," she said. She isn't worried about the newborns getting tangled in the fabric. In fact, Squires said the sweaters are safer than relying on a heat lamp that can potentially tip over in the hay and cause a fire. Sweaters can be dropped off at Sweetwood Farm or at the Halifax Forum Farmers' Market. Squires plans to hold an open house soon so people can see the goats strut around in their handiwork.